the same wild nursery - again, where are the plants for sale? Okay – I just have to say it right out – making a garden in this part of the world is harder than I’m used to. I’ve been crossing my fingers that the plants that I want to use will be available, but until this trip, I haven’t been sure if that was the case. Everyone is very nice – VERY nice, but that nice comes at a price. I am not always told the facts of the matter at hand – I am often told what it is the people working with me think I want to hear. For instance – I am doing a large meadow of Nasella tennuissima … a beautiful sweep of feathery blond grass that will swoon and sway with the wind, and will tickle the spiky leaves of the local sisal agave – Agave fourcroydes, otherwise known as hennequin. No other grass is like this beauty! I have been assured that we have this grass secured. I have doubted it. I have asked for pictures – none. But this grass IS found, I have ben told! When I finally got a photo of the grasses – just as I suspected … pennisetum. Still, I am assured this is the right grass. Sigh. I KNOW a Nasella when I SEE it! BUT I have made significant progress this trip. I finally hooked up with Lucy, the owner of Jardin y Selva, and she is a bamboo maniac. Thank GOODNESS! I have been asking the plant hunters to get me my much beloved Otatea acuminata ‘Aztectorum’, and nobody has been able to find it – even though it is native to Mexico! What the EFF??? Anyway, Lucy to the rescue – she says she has it, as well as other desired varieties. 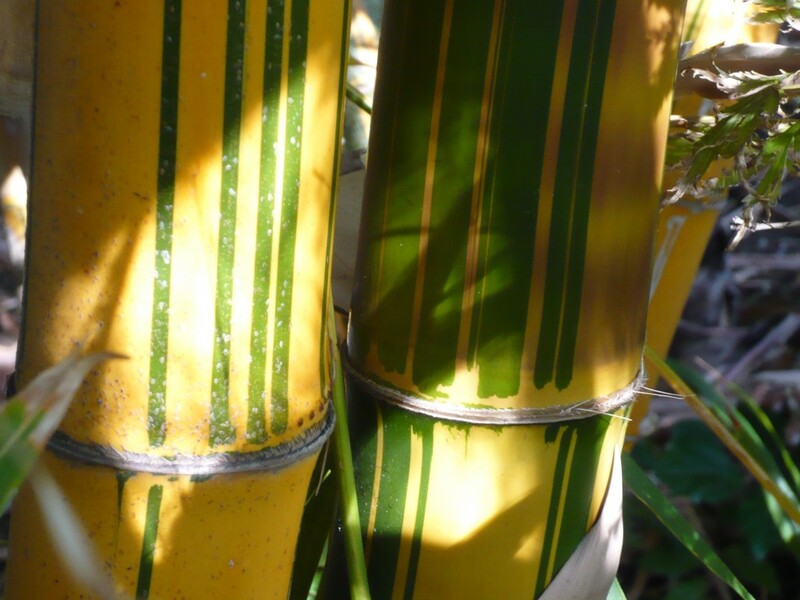 I’m going to be able to plant Bambusa vulgaris vitatta, the Hawaiian Painted Bamboo that has a green drippy stripe running down the culms – such a close-up beauty! Thank you Lucy! But Christopher soothed and comforted me with his dulcet tones cooing in that familiar horticultural sing-song (with an appealing accent redolent of heat, humidity, and habanero peppers), showing me the amazing plants in his vivero (nursery), and thrilling me with big examples of gorgeous palms in the quantities I need. I also saw fantastic plants for the dry part of the gardens – the whole thing is coming together! Thank you, Christopher! just check out the rows and rows of bismarkia for sale! yee-haw! garden here we come! 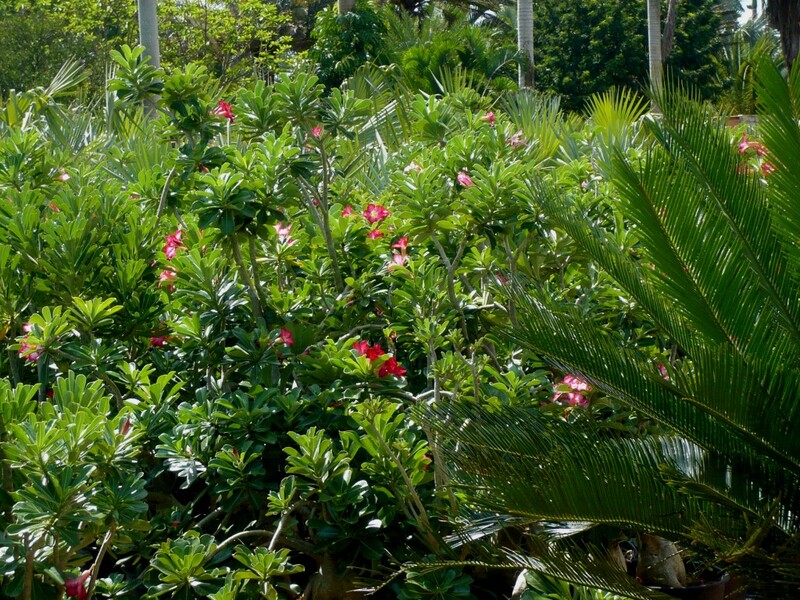 I nearly flew out of my skin when I saw the adenium obesum - be mine! The work that Jorge Pardo Sculpture Studios has done is nothing short of … I don’t even have the words. Out of this world! I am so proud to be on the team that is making this happen! I have been keeping the new structures under wraps, but I feel I should give you all a peak … so I’ll show you what will be the lawn. It is up in the air, on the roof of what is called The Casa Principal (The Main House). 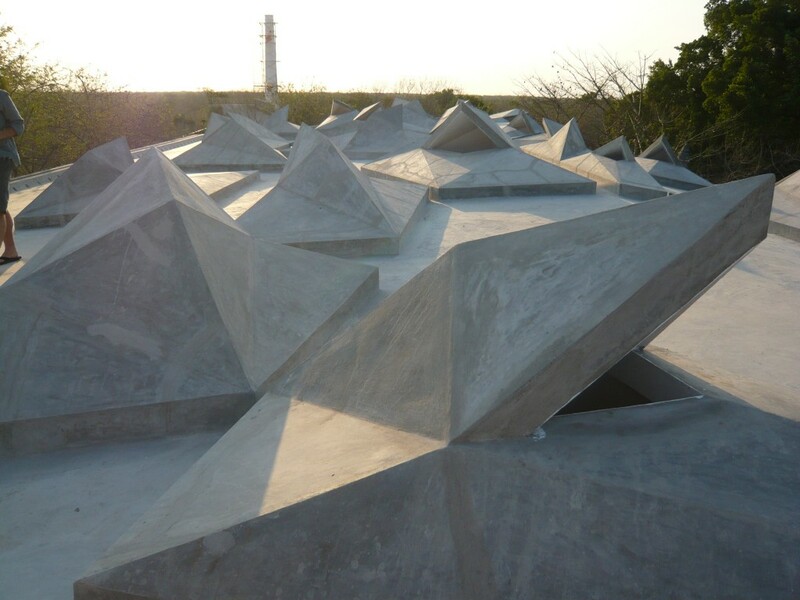 The shapes you see are skylights – but talk about a dramatic sculpture garden! We decided on lawn because of the drama of the sculptures – and because we will be having alot of intensively planted spaces, so we wanted a breath, a quite moment. 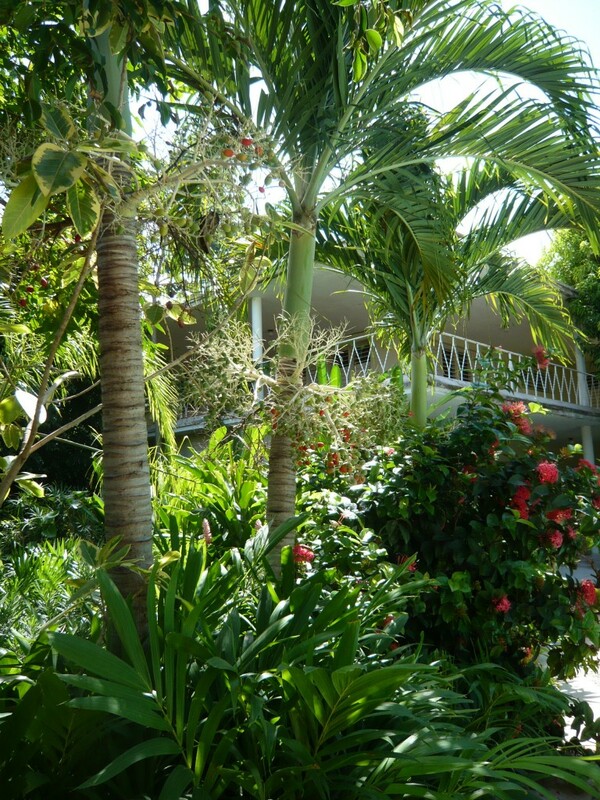 Yes, I am not an advocate of lawn – but here in the tropics a well placed, well thought out lawn can be justified. This is definitely NOT just a pas-thru space! It is so super-cool I can hardly STAND it! Pretty damned beautiful, don’t you think? We don’t know how lucky we have it, do we, to be able to walk into our choice of nurseries or place an online order and get the exact plants we want? 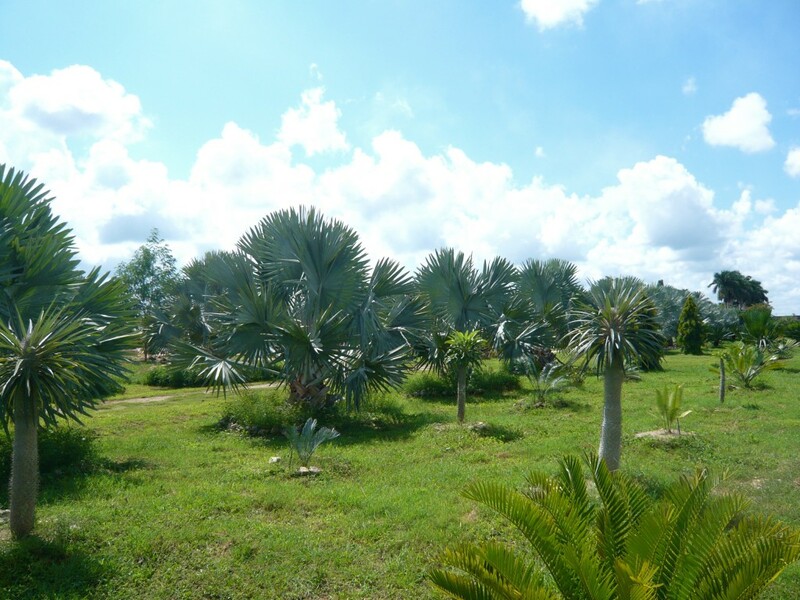 The blogger at Caribbean Garden tells me the same thing: nurseries are few and far between on her arid island, and the agaves and succulents she most wants simply are not to be found there. It doesn’t make sense! Anyway, I’m glad you’re finding (some of) the plants you want. Good luck, Germi. It sounds like an ambitious project. I can’t wait to see everything when you’ve worked your magic. You are persistent to keep insisting on the plants you want. I would too. But it’s so nice to hear your story. I’m looking forward to seeing how you build up your garden and your sculpture garden. Hi I am wondering if you can let us know where to find Lucy’s nursery? I am new to the area and it would be great to find affordable good plants. Any help that you could be great. I’m thinking that a Latin guy speaking horticultural Latin would be pretty hot. Please don’t tell me otherwise… I’d like to maintain that thought! That roof is amazing! Can’t wait to see Phase Dos! Pam is so right-if you want to use grasses and bamboos and agaves its downright difficult-and people look at you as if you are crazy. After all, with all the water guzzling high maintenance tropicals available WHY do you want these weird plants? jorge pardo’s soon-to-be roof sculpture garden is gorgeous. Wow. I have only seen the arid parts of northern Mexico. The jungly images you show are amazing and beautiful! It does seem odd that most nursery people don’t use botanical Latin there: you’d think it would actually make things easier for them, too. Wow! How amazingly frustrating to not be able to get your hands on the plants you want, and to be told that something is what you can clearly see it is not. Might be enough to send me right over the edge! Good thing you are hooking up with those in the know. LOVE LOVE LOVE that roof! Well, you’ve certainly put your finger on some of the challenges to gardening here. I admire your persistence. So glad you caught up with Lucy of Selva y Jardin. We’ve had great luck with Bambusa v.v. The shed leaves are really useful for mulch (including pathways). Have you considered designing with the available plants that are in the very few nurseries rather than designing in your minds eye ? Before I ever put pencil to paper when doing a planting plan I request the current plant availability lists from the various nurseries that I plan to do business with. If they don’t have a current availability list then I go to the nursery and make my own. This saves a lot of frustration. I don’t think I have done a planting plan in the last 10 years without getting an availability list. Some of the nurseries even list quantities, which can be very helpful. Good luck on your project. The hardscaped roof looks fabulously sculptural ! and especially, this glimpse of the roof…unlike any roof I have ever seen! Now, I’m holding my breath. Cannot wait to see the next stage of the process. Amazing writing, as usual. You make me feel like I’m tromping through the nursery with you, on the hunt for plants. good for you for not settling – hang in there! Be tough!! I absolutely cannot WAIT to see what you create! It has been way too long my botanically crazy, gothically heat-challenged friend. The roof lawn is going to look great, odd, but great. I can totally visualize the end result. What an interesting structure, it reminds me of the angular and faceted face from the mechanical-looking butler/android in Red Dwarf…what was his name? Oh yes, Kryten. I always love to read about the progression of your project in the Yucatan, the Obstacles and barriers come with the territory, I am sure with your extensive knowledge of all things green, your accute aesthetic eye and sense of style, you will prevail to form a truly magical scheme. I look forward to more posts as you progress. Pam! You know, I was thinking about my whining about the lack of good nurseries in my neck of the woods – shame on me! I think this job, aside from being a fantastic adventure, is also here to teach me to be grateful for the wonderful things I DO have, such as access to fabulous wholesalers and brokers. Consider my tongue bitten! Yes, when we look for plants in other countries, we are introduced to a VERY different culture! Thanks for your awesome words of encouragement – I can’t wait to see this happen, also! Hey there Mary Delle! You know, when I KNOW that certain plants can be gotten, it KILLS me that people tell me I can’t have them! I will persist until I am shut down in all directions – that seems to be the way of things here … either that or give in and believe what my eyes and common sense tells me isn’t true. Keep on reading – another trip down south happens in a month, and more will be revealed! Hi Shelley! Selva y Jardin has a website! enjoy – Lucy is a character! Have a ton of fun enjoying her and her plants! Oh, Tira – you are singing my song! 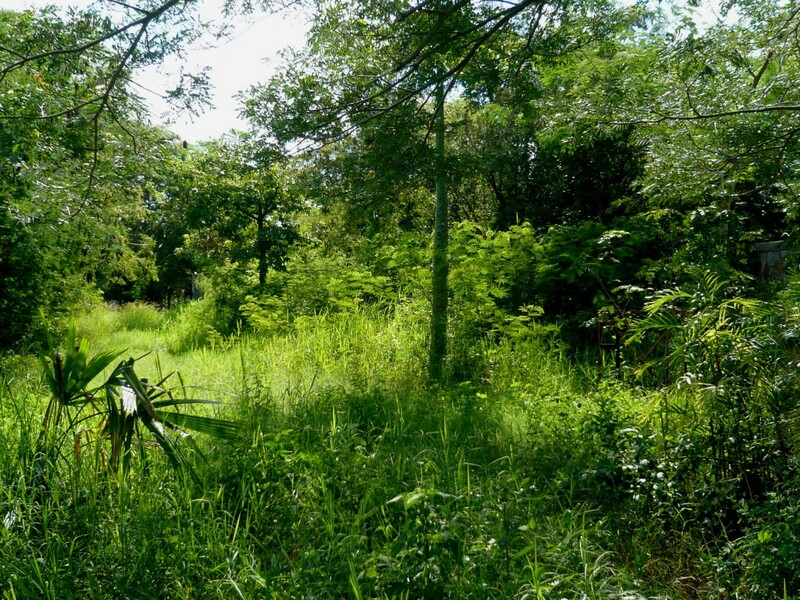 I am very into using local plants, of course – but local / native plants include agaves, bamboos, and grasses that I am told are impossible to find! Thank goodness I am finding people who are willing to go a little further and not just look at the local Home Depot for my plants! I’m glad you like the roof – it’s pretty incredible! Hi Jane – I’m with you … it would make their jobs SO much easier! But you would be amazed – the OWNERS of most of these nurseries don’t hortspeak. Weird! When I met the young guy, Christopher, at Jardin Jurassico, it was so obvious that he had a passion, and his knowledge came from him deciding to go above and beyond what was demanded of him. Most others who work at the viveros seem to think the common names are enough, and to be fair – most of the times, for most of their clients, they are. But then comes the obnoxious lady plant freak from El Norte, demanding that everyone speak botanical latin! Hahaha! Loree, there was a moment when I felt myself on the verge of a freakout, but I pulled back, regained my composure, and then had a tequila shot. And I was rewarded by meeting the wonderful Christopher, King of Botanical Latin Merida-Style! Just WAIT until you se the REST of the architecture!!! XO! McM! You have been SUCH a total help! Seeing Lucy was awesome – and knowing that I could have the bamboos I KNEW must be available was a wonder! I am SO THRILLED about the B. vulgaris vittata, and it is so great to know that it grows well for you! HOORAY! And right on for using bamboo leaves for mulch on pathways – you are doing it all, my friend! Hi Michelle D.! HAHAHA! Of COURSE I use availability lists (I am not fond of working hard and then finding out I can’t get half of the plants I want!) – but get this … there ARE no availability lists! The first thing I ask for wherever I go is their lists, and I inevitably get a blank stare. Then I get interrogated as to why I want it, and they can’t seem to understand why I’d need it just to put some plants in a garden. They just don’t work that way down there – they all say to give them a list of what I need, and they’ll find it. EVERY SINGLE PLACE I GO. The wonderful Christopher is the first to offer me a list – but he is WRITING IT UP HIMSELF, because no list exists, not even for inventory purposes. It is a different world down there my friend! I know – if we up here would design w/o our availability lists, we’d be foolhardy! There – well … that is kind of how you have to roll! And so thus I roll, getting things done with a little flirting and a little bullying and alot of ‘letting it go’! Cross your fingers for me! Tendril! She of the BEST CALIFORNIA BLOG! Take note everyone – we have ALWAYS loved her!!! 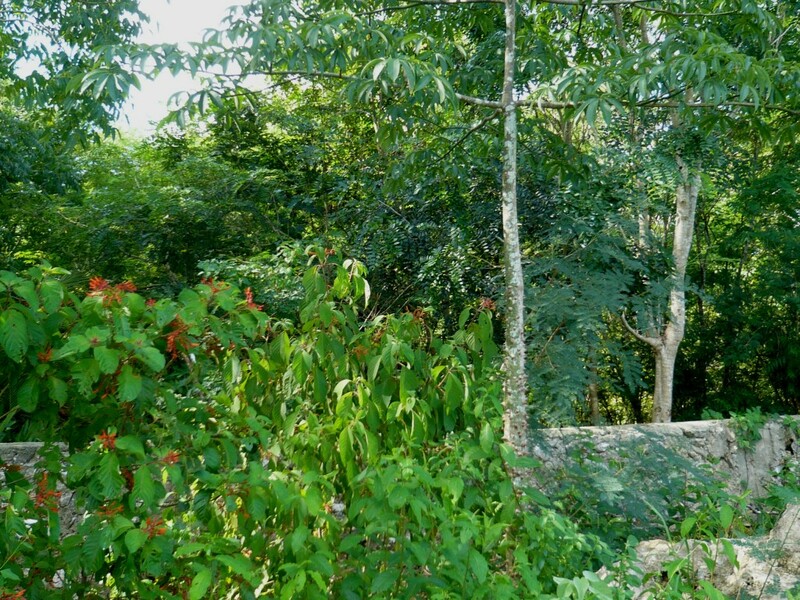 Okay, you have to come down to the Yucatan with me, after the garden has had a little time to grow in, and I would be SO HONORED if you’d write a post about it for your blog! You, of all people, are going to D-I-E DIE! And yes, I melted. Like the ice in Grow/Melt! But I reconstituted to fight again another day! XOXO! Your words help so much! You KNOW how you have to fight hard sometimes to get the exact right thing … I’ll be strong, even though it can be a bit difficult – but it is SO WORTH IT! This is a project like no other, and I love sharing it with you! ESP! Our comments must have crossed in cyberspace! I am so happy you’re back – you know how much I relish my visits to The Patch! Oh, you MUST have Bambusa vulgaris vitatta – if only for that name, which drives the architects working on this project to fits of hysterical laughter. One of them actually took to signing off of her emails and skype chats as ‘Bambusa vulgaris’. But it’s the vitatta that makes it so special – all that green drippiness! It’s a little tender, though – I nearly lost it during the big freeze we had here in ’06. I wonder if it could work for you – maybe in a protected spot? Oh, thank you for your words of encouragement! I am alternately thrilled and scared and excited and freaked out, but the balance of it all is a high wire act that I am really enjoying! Now I’m going to scoot on over to your neck of the woods and do some fun perusing!